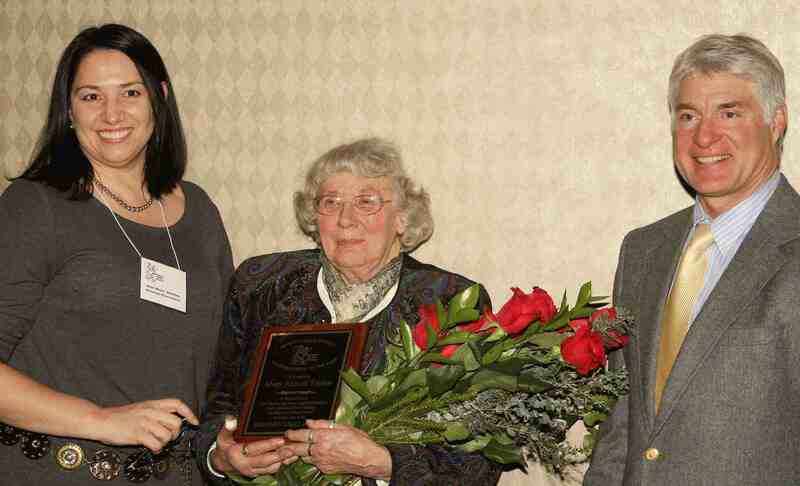 On Saturday, January 15, 2011 the Minnesota Horse Council recognized Mary Abbot Taylor of Ogilvie, MN as the 2010 HORSE PERSON OF THE YEAR at the Annual Meeting held at the Northland Inn in Brooklyn Park. Taylor had been nominated by Anita Grant and the MN Arabian Horse Association based on her many years of dedication, not just to their own organization, but because of her involvement and contributions over her lifetime to so many young people she has touched in the equine world. Taylor started with her first horse, Amos, a black grade gelding, back in 1944. She was a member of the Steeplechase Riding Club in Hopkins, MN while in high school. She started volunteering at the Minneapolis Saddle & Bridle Club shows until she graduated from High School. Over these few years, she was fortunate to own and show a variety of different breeds as well as mixed breed horses. After high school, Taylor left MN to work at an Arabian horse Ranch in Cheyenne Wyoming. This particular ranch where she was working just so happened to be owned by Anna Best-Joder, editor and publisher of the first Arabian magazine, The Arabian Horse News. Not only did she get to work with horses, but she also became the ‘go-fer' for the magazine. As part of her WY experience, she was involved in putting on the first Arabian horse show in WY. Taylor was able to ride and attend shows in CO and participate in the Cheyenne Frontier Day Parade, and at these events, she was introduced to many of the big time Arabian breeders and trainers of that era. It was not until 1950 that she purchased her first Arabian horse, which was from Daniel Gainey, Gainey Arabians of Owatonna, MN. Daniel Gainey was, by the way, recognized in 2001 with our Pioneer Award honor for all he had done in his lifetime to the horse industry in MN. In 1951, Taylor started working at the Campbell Farm, and eventually became co-manager. While working there, she started coordinating and running horse shows, many of which were open to any breed, and they all included multiple disciplines, including western English, jumping, and driving both pleasure and carriage. As a riding instructor, she taught many to ride horses, some of whom are still riding today. She was a 4-H leader for Hennepin County and participated in hosting clinics for young children and adults alike. By 1954, Taylor was ready for a new challenge. Taylor and a few others founded the MN Arabian Horse Association which still exists today. By 1955 and '56, she had put on the first two MN Arabian Horse Association horse shows and also participated herself in the 1955 MN State Fair's first Native Arabian Costume Class which is still a huge draw even today. Taylor served as VP, Secretary, President and chaired several committees for MAHA, while still working her full time job and putting on horse shows on the side. In 1972, Taylor and her husband, Bob, were given the Governors Trophy by the MAHA in appreciation for all their dedication and countless hours over the prior three decades. That was 38 years ago and Taylor is still going strong. Without revealing her age, Taylor is perhaps the oldest person to ever be awarded the Horse person of the Year award and she still continues to be involved with various organizations even today that keep her active in the equine world. Over the past 3 decades, Taylor began to get involved with Carriage driving and even today, well into her 80's she is still a contributing member of the carriage shows and drives. Taylor was the 1993 President for the MN Whips & Wheels Carriage & Driving Association. In the mid 90's Taylor moved to the Mora/Ogilvie area and started organizing a new carriage and driving club called the North Country Carriage Club, of which Taylor served as President and secretary for many years. Taylor continues to stay active in carriage and driving events, participating at the St Croix Horse & Carriage Society events, the Sleigh and Cutter Festival and has even spent many years working the MAHA booth at the MN Horse Expo. Taylor and her husband have brought carriages for display, and today they still continue to be involved with the Whips & Wheels and St Croix booths at EXPO. Taylor continues to touch people's lives in the horse industry and many people attended the event just to witness her being honored with this award. Taylor also continues to stay involved and support those that are learning, and while most people her age are in retirement homes, she continues to educate herself with new equine adventures. She is still learning Dressage Driving at the carriage events and loves to learn. Taylor credits the horses with keeping her young at heart, mind and body.